Are you staying in Glasgow over the summer? Fancy getting to know the city a little better? Guest writer Alison Eales, musician and former PhD researcher at the UofG, has the perfect way to discover more about Glasgow's unique music scene. Alison, who plays keyboard in the band Butcher Boy and sings with the Glasgow Madrigirls, is a tour guide with Glasgow Music City Tours, and here she shares her love of the Glasgow Jazz Festival and Glasgow's music venues. Plus, she reminds us that PGRs can take their research in all sorts of unexpected directions – if we stay open to different opportunities! On 28 June, my time at the UofG came to an end. It felt like I’d been a student forever. For a variety of personal and professional reasons, it took me longer than expected to complete my PhD, but I suspect the real reason I feel like such a veteran is that I’ve previously been a UofG undergraduate (English Language class of 2003) and taught postgraduate (Popular Music Studies class of 2011), as well as doing a sabbatical with the SRC. I’ve been on the books for eleven years of my life! Compilation from Glasgow Jazz Festival 2014. Video credit: Alison Eales. My PhD is a critical history of the Glasgow Jazz Festival and was supported by a Collaborative Doctoral Award from the AHRC, with the Festival acting as a partner in the research, as well as its subject. Working with the Festival has been an amazing experience. I’ve met some of the greats including Ginger Baker, Pharoah Sanders and Annie Ross, and have developed a real love for younger acts including Zoe Rahman and Neil Cowley. The Festival started in 1987 and has run every year since, making it Glasgow’s longest continually-running cultural event. While this is impressive, I was interested in the wider context in which the Festival came about. During the 1980s, Glasgow’s authorities were committed to cultural tourism as a driver of urban regeneration, but also to culture for the public good. Glasgow Jazz Festival has always aspired to support local musicians, as well as attracting jazz luminaries to the city. These aims reflect the ethos of Glasgow’s wider ‘cultural renaissance’ – in 1990, when Glasgow was European Capital of Culture, a conscious decision was taken to use a broad definition of the word ‘culture’ and to ensure that local assets and achievements were championed alongside international acts like Pavarotti and the Bolshoi Ballet. Last year, I was approached by Glasgow Music City Tours to develop and deliver a walking tour marking the Jazz Festival’s 30th anniversary. This wasn’t a history tour as such, but rather a chance to visit some Merchant City venues and to tell my favourite stories about the big names who have performed over the years, including Miles Davis, Sarah Vaughan and Tony Bennett. The company run two regular tours: Merchant City Music Past and Present and Glasgow’s Music Mile. Like the Jazz Festival tour, they are based on entertaining stories about artists and venues. I now guide both tours a couple of times a month and really enjoy it, especially on a sunny day. Most of our guests are local, and many tell us that the stories and places included on the tours are new to them. We’ve just received a Tripadvisor Certificate of Excellence based on our positive reviews, and are currently rated 9th of 80 tours in Glasgow. Undoubtedly, the highlight for me is being able to go into the Britannia Panopticon Music Hall on a regular basis. It is my favourite place in Glasgow and a fascinating part of the city’s cultural heritage. I still get goose-bumps whenever I walk in, and it is a joy to take people there for the first time. Lots of cities have a strong musical culture, but Glasgow is one of two in the UK with the designation UNESCO City of Music (the other being Liverpool) – an official recognition of the importance of music to the city. Glasgow Jazz Festival has contributed to our vibrant music scene not just by attracting big names and supporting local musicians, but also by developing The Old Fruitmarket as a venue in the early 1990s and championing it when it came under threat of closure in the early 2000s. 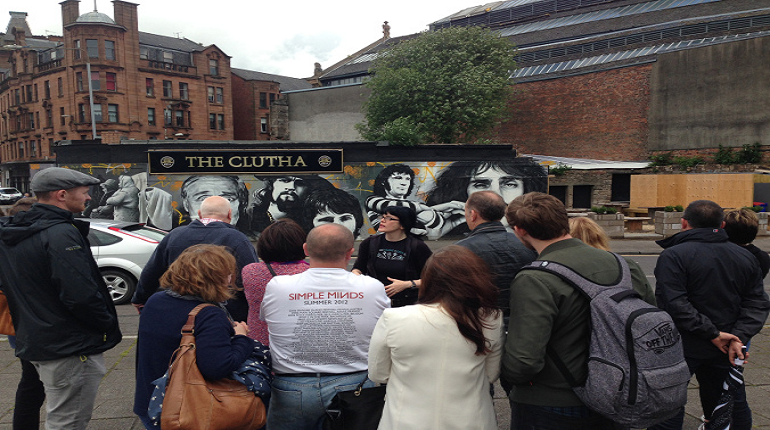 Glasgow Music City Tours are very mindful of the UNESCO designation, and we get to celebrate it every week. When I started my PhD, I had no idea that I would end up doing music history walks along with the usual mix of publishing and teaching. You just never know what opportunities will come up! Jul 26 On your bike!